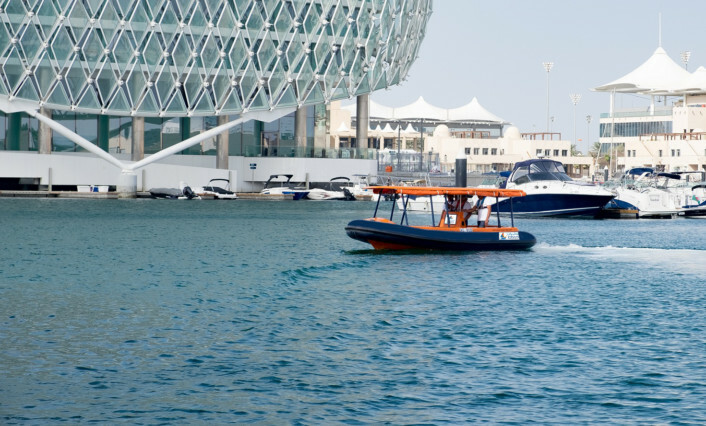 New high speed water taxis will provide transportation to and from Abu Dhabi’s Yas Island from a number of locations in the area, it was announced on Monday. The water taxi, which can carry up to 10 passengers, will be an extra mode of transport for residents of Raha Beach — including Al Muneera, Al Bandar and Al Zeina — heading to Yas Marina and Yas Links, in addition to other Island locations in the future. The new service will also connect with the existing high-speed ferry service that Jalboot currently operates around Abu Dhabi city, stopping at Yas Marina, Abu Dhabi Mall, Etihad Towers and Fairmont Hotel. Tickets for this ferry service are sold and priced separately from high-speed taxis. The new service will operate ‘on demand’ around Yas Marina, Al Bandar and Al Muneera from February 1 to February 13, after which scheduled services based on polling of interested individuals through Jalboot’s Facebook page will be announced. This service is the latest visitor-friendly component to be added to Yas Island’s transportation offering, which already includes the new Yas Express shuttle service and the ADCB Bikeshare network powered by Cyacle. Tickets for the new service are available on board, with no prior reservation required. Ticket prices for the high-speed taxis are: Dh15 for one ride, Dh25 for two rides and Dh40 for an all-day pass.